VICTORY over Hawick Royal Albert at Saughton tomorrow would see Lothian Thistle Hutchison Vale clinch Section B of the Qualifying League. 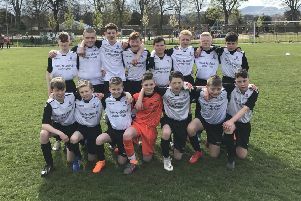 Manager Raymond Carr has been delighted with the East of Scotland League champions’ start but admitted: “In terms of fitness levels, there are a couple of boys who are still a bit behind but the squad has an average age of just 22. Carr, meanwhile, hopes to complete the signing of former Edinburgh City striker Ryan Wilson next week. Craigroyston host Peebles Rovers at St Mark’s Park tomorrow in the other Section B tie. Craigie boss Andrew Brown is set to keep faith with Shaun Smith in goal after the youngster made a midweek penalty save in the 2-1 win over Hawick. “Shaun knows he has to work on his distribution but his shot-stopping is very good and he certainly did his prospects for tomorrow no harm with his midweek performance,” said Brown. In Section A, Tynecastle travel to Burntisland Shipyard with boss Stevie Vinter expecting a tough match despite his side’s resounding 5-0 win over Eyemouth United on Wednesday night. That victory saw Scott Coleman net a second-successive hat-trick, with Robbie McIntyre also on target. “Burntisland Shipyard got a good result against Civil Service midweek so we’ll have to be on our guard,” said Vinter. Alex Cunningham’s Civil Service Strollers will be looking to bounce back from their midweek 3-2 loss to Shipyard when they travel to Eyemouth United. A win for Strollers would guarantee at least second spot in the group. All tomorrow’s matches in Groups A and B kick off at 2.30pm.